It’s that time of year again when parents and children across the country are preparing to go back to school. August is designated as Back-to-School Safety Month, and we want to remind motorists to be extra careful at all times. Be on the lookout for school zone signals and ALWAYS obey the speed limits. When entering a school zone, be sure to slow down and obey all traffic laws. 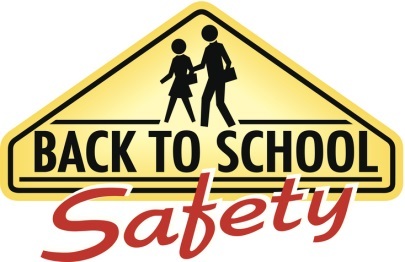 Be aware of and watch out for children near schools, bus stops, sidewalks, in the streets, in school parking lots, etc. Never pass other vehicles while driving in a school zone. Never change lanes while driving in a school zone. Never make U-Turns while driving in a school zone. Never text while driving in a school zone. Avoid using a cell phone, unless it is completely hands-free, while driving in a school zone. Check with the school to make sure your child is allowed to ride their bicycle to school. Some schools do not allow students to ride bicycles to school until they reach a specific grade. Make sure your child always wears a bicycle helmet! Failure to wear one could result in a traffic citation. Furthermore, in the event of an accident, helmets reduce the risk of head injury by as much as 85 percent. Obey the rules of the road; the rules are the same for all vehicles, including bicycles. Always stay on the right-hand side of the road and ride in the same direction as traffic. Be sure your child know and uses all of the appropriate hand signals. Choose the safest route between home and school and practice it with children until they can demonstrate traffic safety awareness. If possible, try to ride with someone else. There is safety in numbers. Leave early enough to arrive at school at least 10 minutes prior to the start of school. Use the same route every day and never use shortcuts. Go straight home after school. Do not go anywhere else without permission. Always use public sidewalks and streets when walking to school. Demonstrate traffic safety awareness and pick the safest route between your home and the school and practice walking it with your children. Try and walk to school with other students. There is strength in numbers. Teach your children to recognize and obey traffic signals, signs, and pavement markings. Only cross streets at designated crosswalks, street corners and traffic controlled intersections. Always look both ways before crossing the street and never enter streets from between obstacles like parked cars, shrubbery, signs, etc. Always walk and never run across intersections. Avoid talking to strangers. Teach your children to get distance between themselves and anyone who tries to approach or make contact with them. If a stranger does approach your child, make sure they know to immediately report the incident to you or a teacher. Teach your children to never get into a vehicle with anyone, even if they know them, without your permission. To prevent injury, backpacks should have wide straps, padding in the back and shoulders, and should not weigh more than 10 to 15 percent of a child’s body weight. When placing items in a backpack, place the heavier items in first. The closer the heavier items are to a child’s back, the less strain it will cause. Children should use both backpack straps and all compartments for even distribution of weight. Remove drawstrings from jackets, sweatshirts, and hooded shirts to reduce the risk of strangulation injuries. Art supplies in the classroom should always be child safe and non-toxic. Make sure your child’s school is up-to-date on the latest recalled children’s products and toys. Make habit of arriving at the bus stop at least five minutes before the scheduled arrival of the bus. Make sure your child stays out of the street and avoids excessive horseplay while waiting for the school bus. Be sure the bus comes to a complete stop before getting on or off. When riding the bus, make sure your child understands they must remain seated and keep their head and arms inside the bus at all times. Do not shout or distract the driver. Do not walk in the driver’s “blind spot” – this is the area from the front of the bus to about 10 feet in front of the bus. Everyday we need to be careful when going about our household chores, but when you really start tearing the house apart and moving things around during spring cleaning, especially with all those cleaning supplies and equipment out, it is doubly important to keep safety in mind. Spring cleaning can be tiring work. Do not forget safety even if you have worked hard all day and want to get done. The better thing to do when you are exhausted is to stop and take a break, drink a glass of water, sit under a nice cool fan, and rest instead of being unsafe. (1) Be careful moving large pieces of furniture and appliances. Always have spring cleaning safety in mind. (2) Be safe while on ladders and step stools. When doing a task, such as washing windows, where you need to be on a ladder use extreme caution. Do not lean too far to either side. A good rule of thumb is that your belly button should not go beyond the sides of the ladder. Also, have someone available to hold the ladder steady for you if possible, and make sure before you step on them that the rungs are not wet, and you are wearing non skid shoes. (3) Be careful when walking on wet surfaces. Make sure you take the proper precautions to keep from falling. Also, make sure others in your family, including children, are also warned of the wet floor to keep them safe. You may need to block small children’s access to wet floors because they just don’t understand not to run and slide on them. (4) Keep stairs, landings, and walkways clear of boxes, bags & other clutter. Spring cleaning is a great time to declutter your home, but you need to make sure all the boxes and bags of stuff you are getting rid of don’t cause a safety concern. Make sure you place them outside walkways and especially away from steps and stairs where someone may trip on them. (5) Don’t carry too much stuff at once, especially on stairs. Make sure you keep a hand free to hold onto the stair railing. Also, whether you have stairs or not, always make sure you can see over the load you are carrying so you do not trip. (6) Follow cleaning product label safety instructions and recommendations. Cleaning supplies can create nasty fumes, so make sure you get some fresh air by opening windows, turning on the exhaust fan, or placing a fan in the room. In addition, do not mix ammonia and bleach together, both of which are common household cleaners, because they create toxic fumes when combined. You should also wear rubber gloves to keep your hands from getting dry and cracked from the hot water and chemicals. (7) Wear a mask when cleaning dusty areas. This may seem like overkill to some, but if you are at all allergic to dust this tip is very important. (8) Do not leave buckets filled with water around your home. Even if you need to take a quick break make sure you empty that cleaning bucket, or at least put it in an inaccessible area. Even small amounts of water are a drowning hazard for small children. (9) Put away all your cleaning supplies when you are done. Cleaning your home may not always be a pleasure, but it never has to be a hazard. Follow these spring cleaning safety tips to have a safe and productive spring cleaning! This message is brought to you by Hinkle Contracting Company who would like to remind you that safety in the workplace makes Good Business Sense. Thank you so much Hinkle for these great safety tips!! !